It is almost July again, our second at Ascog Hall, although the garden seems to develop just a little later than last year. But the vivid flora of the summer months compensates for losses due to the unusual cold and excessive wet spring and deer damage. As in June, many perennials are in bloom and the garden is lush with vegetation. My task for this month is not so much weeding but the continuous process of still naming a good portion of the plants while enjoying the colourful delights of our garden. I have to mention a favourite, the discreet Kirengeshoma palmata. 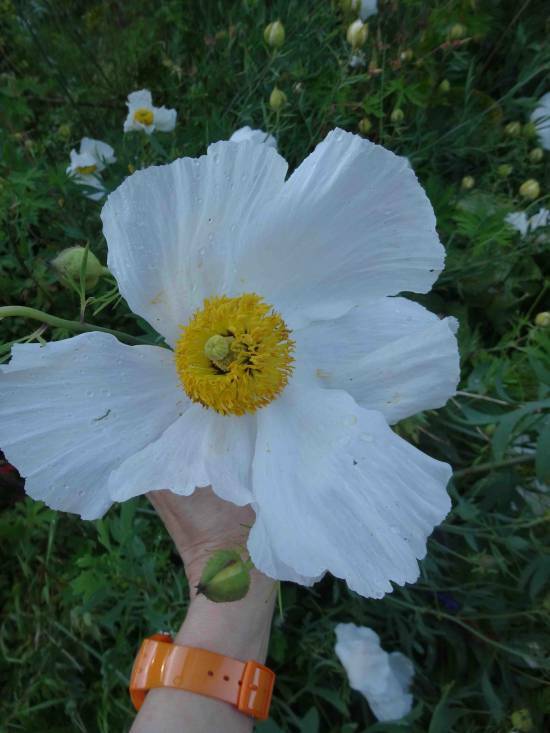 Then there is an eyecatcher, the striking bush like 5 ft high Romneya coulteri with its huge flowers resembling fried eggs. Throughout the garden wild strawberries will soon tempt the visitor to be picked and several Leycesteri formosa bushes with their hanging dark red flowers are a pleasing sight. The number one attraction for bees this month is the Eucryphia lucida ‘Pink Cloud’ with its plentiful flowers, producing a famous honey in its place of origin, Tasmania. What a good decision it was last year to leave part of the main lawn uncut and give native wild flowers a chance. Three different kind of native hardy orchids were the first ones to thank us for it! We are still unaccustomed to having orchids in our own garden, no matter how common it is in Scotland and to look at the rear garden filled with Dactylorhiza purpurella remains exciting. July of course is a time of roses. The Rose Garden, filled with a tender fragrance and in shades of pink, violet and red, presents a harmony of roses, fox gloves, phlox and Mediterranean herbs. The treasure of the Ascog Hall coastal Gravel Garden is finally revealed in July with yellow spires of the Verbascum ‘Gainsborough’, Acanthus spinosus, phormiums, bamboos, yuccas, the tall spiky Dipsacus fullonum and a rather exotic restio specimen. 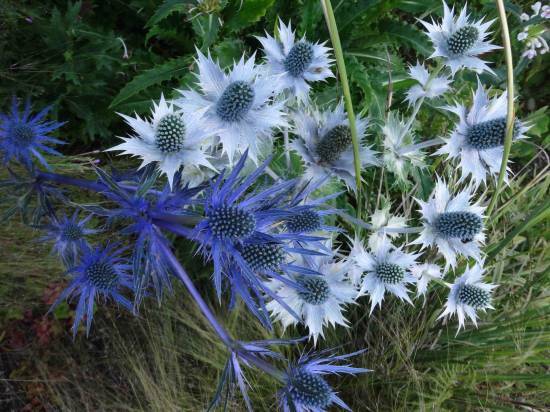 These exotics surround the centre of the Gravel Garden which has fields of fine long grasses mixed with the bright blue/ghostly grey Eryngium giganteum - the dominating plant of the Gravel Garden. The long branches of the Dierama pendulum and the favourite Verbena bonariensis tower above. The Fernery received a good spring work over and the ferns are doing well. To quench their thirst at this time of the year is highly time consuming but the job of watering them is always pleasant and allows time for meditative contemplation. Wildlife in the Fernery, so abundant and present in spring, has now left. Only the two tiny terrapins and the odd goldfish that has managed to escape the eel can be spotted.